I’ve played basketball with Manny Pacquiao. He’s good. But PBA good? As in ready to compete against Marc Pingris, PJ Simon, Jimmy Alapag and Paul Lee? Ha-ha. It’s like the reverse question: Can Calvin Abueva don boxing gloves and fight in the ring? The answer is Yes. But ready to brawl in an ALA Promotions undercard? Absolutely not. Same with Pacquiao. He can jump 10.5-feet high, elevate his 141-lb. frame and strut an acrobatic lay-up. In our basketball games back in 2007 when he trained against Marco Antonio Barrera, when he would sprint down the lane, our defense parted like Moses parted the Red Sea. The reason: We didn’t want to harm him. Imagine MP getting injured not inside the 23’ x 23’ ring but on the basketball floor? Kita sad-an sa injury. That’s what happened in Cebu Coliseum. 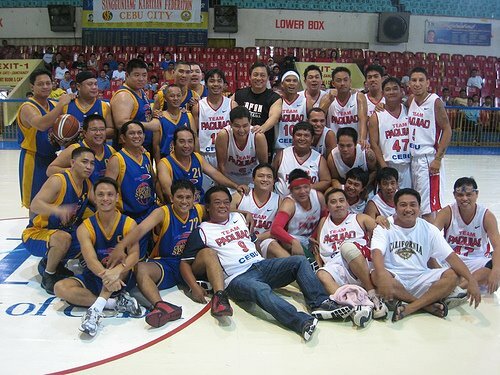 His Team Pacquiao battled our Sportswriters Association of Cebu. In one moment I’ll forever remember, Manny dribbled the ball as point guard. While moving forward, I flicked the rubber ball for a steal. The ball bounced away from Manny and towards the open court. He sprinted. I sprinted. We both lunged forward, diving on court, eyes fixed on grappling that ball. Imagine if Manny had gotten injured and called off the Barrera multi-million-dollar bout? In the upcoming PBA season, you’ve read the news: Apart from the 10 existing PBA teams, the league is expanding and will accommodate two more squads. There’s Blackwater Sports and Kia Motors. The head coach for Kia? The boxer who’ll be fighting this Nov. 23 in Macau. Why, of all people, did Kia ask Manny? At this point in his career when he hasn’t retired yet? Why not Cebu’s pride, the nation’s most decorated coach who has yet to coach the pro league, Raul “Yayoy” Alcoseba? Kia has two picks in the second round of the draft. Will they sign him? Sure. Long ago, he announced that he wanted to be both PBA coach and player. The critics questioned the legality. He’ll get his wish nonetheless. True. But couldn’t he have waited after his boxing career to shift to basketball? Focus on one target at a time? It’s not as if these world titles fights are tiny goals, right? He’s earning over a billion pesos per bout. But then again, if Manny waits after boxing, that’s nearing 2016 — and won’t he run for Senator? That’s even better. Then, his credentials will read: PBA coach-player. Boxing world champ. Billionaire. Senator. Will his boxing suffer at this time? He knows that if he loses this November, that’s the end of his boxing career. The wise man that he is, that’s why he chose a nobody in the name of Chris Algieri who, despite his 20-0 record, is unheard-of. With the PBA, what a team name: Kia Kamao. If my research is correct, “kamao” has two meanings. In Bisaya, it means “skillful;” in Tagalog, it’s “fist.” Exceptional choice of name. The initials are easy to remember (“KK”) plus both meanings describe their coach/player. Kamao gyud ni si Manny.